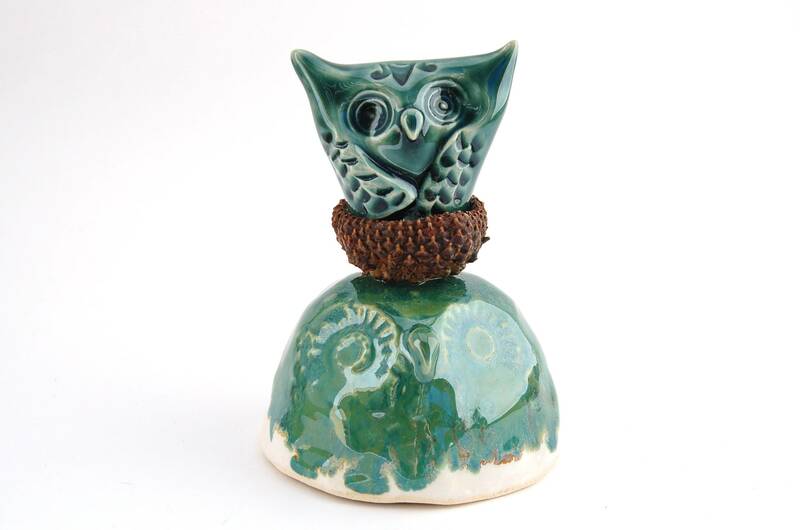 "Almost Too Big For the Nest" is a small mixed media sculpture of a mother owl and her growing owlet. Both mama bird and baby bird are hand sculpted of white stoneware clay using the pinch method and texturized using hardwood stamps and vintage buttons. Baby is glazed with a dark green celadon high gloss glaze and Mama has a layered look, with a base of snow white and seaweed gloss over top. You can see yellow and red brown breaks in various places near the base of the figurine. A real acorn cap is affixed using 2-part epoxy to the top of mother owls head. The acorn cap is sealed with poly acrylic. "Almost Too Big For the Nest" would make a lovely baby shower gift or first Mother's Day gift. It's a glossy, joyful depiction of motherhood that would brighten an owl lover's day as well. This sculpture measures 3.5 inches tall and sits sturdily on a base of 2.5 inches around. Ceramic and Woven Fiber Owl Wall Hanging - Mixed Media Owl Wall Tile - Ceramic Gilded Weaving Fine Art Raptor Decor - "Nicholas"
Ceramic Owl Sculpture - Mixed Media Bird Statue - Needle Felted Hand Beaded Raptor Figurine - Hand Built Fine Art Owl - "Josephine"